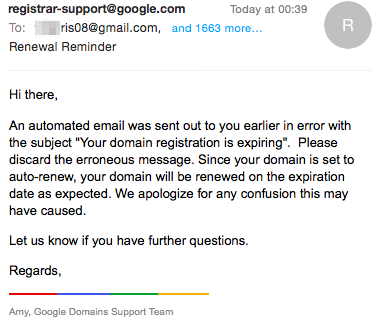 Google has recently sent notifications about some domains that are about to expire. "Your registration of domain.com is about to expire. This means that users will no longer be able to access your website at that time." "An automated email was sent out to you earlier in error with the subject 'Your domain registration is expiring'. Please discard the erroneous message. Since your domain is set to auto-renew, your domain will be renewed on the expiration date as expected. We apologize for any confusion this may have caused." 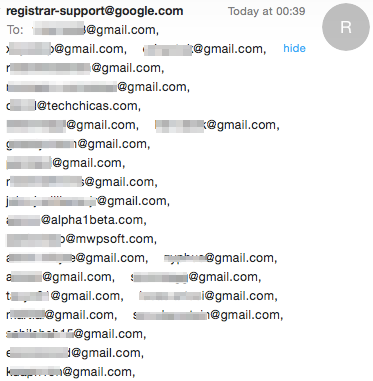 Unfortunately for Google, the message was sent to 1664 people and all the email addresses were added to the "to" field, so everyone can see them. Whoops! Update: Google sent a new message. 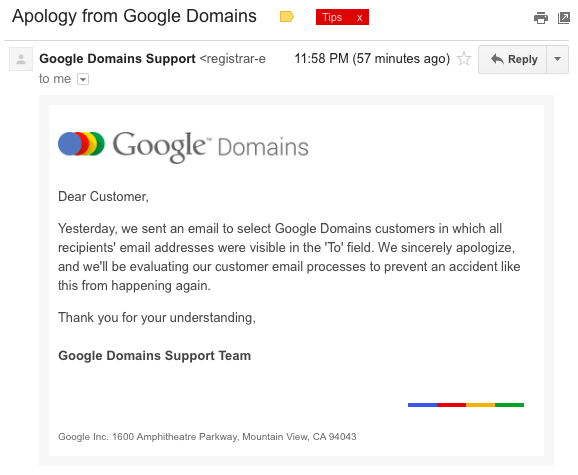 "Yesterday, we sent an email to select Google Domains customers in which all recipients' email addresses were visible in the 'To' field. We sincerely apologize, and we'll be evaluating our customer email processes to prevent an accident like this from happening again. Thank you for your understanding." 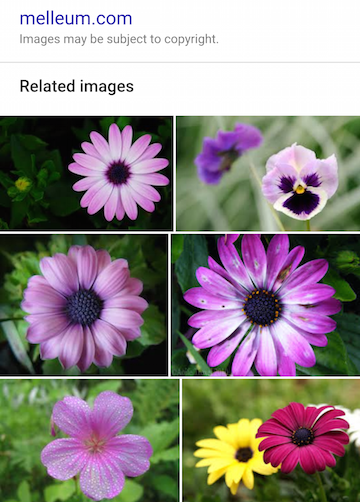 Google Image Search has a new mobile interface. When you tap a thumbnail, Google shows the image result, a link to the page and a long list of related images. Below the search result, you can find a list of similar images. You can still swipe left or right to go to the previous or the next image result. Tap the image to hide everything else. Google bought Word Lens last year and brought a very useful feature to Google Translate: real-time visual translation. Use a phone or a tablet running Android or iOS, point the camera at a sign or text in a foreign language and Google will translate the text almost instantly, while preserving all the other details. It's like using a magic camera that translates text and lets you read street signs, restaurant menus, user manuals, newspaper articles even if they're written in foreign languages. Visual translation now supports 20 additional languages. "You can now translate to and from English and Bulgarian, Catalan, Croatian, Czech, Danish, Dutch, Filipino, Finnish, Hungarian, Indonesian, Lithuanian, Norwegian, Polish, Romanian, Slovak, Swedish, Turkish and Ukrainian. You can also do one-way translations from English to Hindi and Thai." Back in January, the feature was launched with only 7 supported languages: English, French, German, Italian, Portuguese, Russian and Spanish. This feature requires to pick the right languages before tapping the camera button and one of the languages must be English. You'll probably be prompted to download a small language pack, since you can use Word Lens offline. Google Research Blog has more information about Word Lens. After finding the text regions in the picture, Google recognizes the letters using a convolutional neural network. "Letters out in the real world are marred by reflections, dirt, smudges, and all kinds of weirdness. So we built our letter generator to create all kinds of fake 'dirt' to convincingly mimic the noisiness of the real world—fake reflections, fake smudges, fake weirdness all around." After recognizing the letters, Google translates the text taking into account that text recognition might include mistakes, then it "renders the translation on top of the original words in the same style as the original". Google actually erases the original text using the colors surrounding the text and draws the translation using the initial foreground color. It's quite clever. 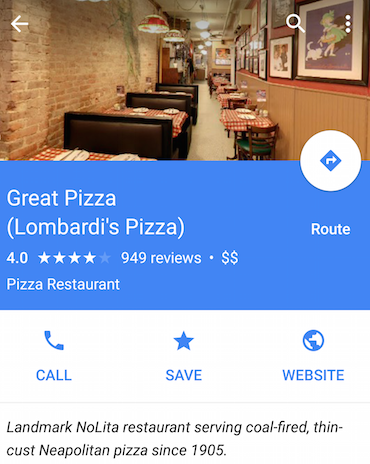 Google has a new feature for local search cards. When you search for restaurants, stores, museums and other places, you can now see the busiest times of the day or week. The new "popular times" section shows when it's a good time to go to a certain place and when it's best to avoid it because it's too crowded. 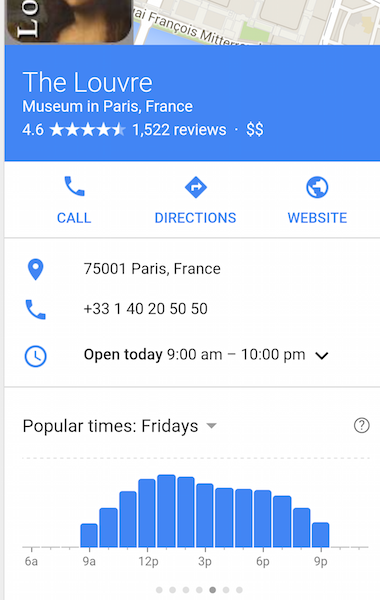 "Now, you can avoid the wait and see the busiest times of the week at millions of places and businesses around the world directly from Google Search. 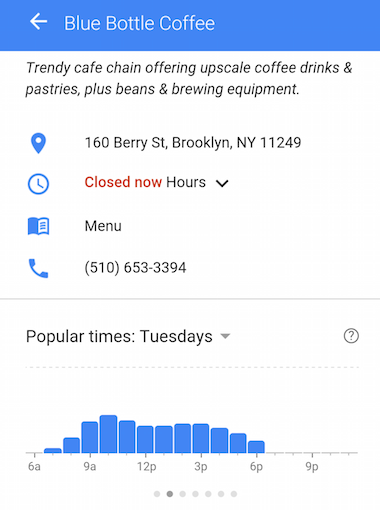 For example, just search for "Blue Bottle Williamsburg", tap on the title and see how busy it gets throughout the day," informs Google. For now, it seems that this feature is only available in the mobile interface. Google says that the data is based on historical visits, so I assume it uses Location History and other location services for mobile devices. Google Maps has a similar feature that shows typical traffic. Google+ Photos has a few search filters that are pretty useful. You can find them if you click the small arrow from the search box: Auto Backup, Hangouts, Google Drive, Posts, Auto Awesome, Videos and more. The nice thing is that most of them are also available in Google Photos. #CAMERANAME - replace CAMERANAME with the your camera's model or brand to see all the photos taken with that camera. Some examples: #Nexus5, #Canon, #iPhone. After so many years of promoting Google+ and integrating it with other services, Google realized that Google+ doesn't mean a lot for many Google users and it started dismantling Google+. Google Photos is now a standalone service and other Google+ features will follow suit. In a blog post, Google announced that Google+ profiles will no longer be required and YouTube will be the first service that will make this change in the coming weeks. "A Google Account will be all you'll need to share content, communicate with contacts, create a YouTube channel and more, all across Google. Your underlying Google Account won't be searchable or followable, unlike public Google+ profiles. And for people who already created Google+ profiles but don't plan to use Google+ itself, we'll offer better options for managing and removing those public profiles." A lot of YouTube users complained when YouTube switched to a new commenting system which required Google+ profiles, but YouTube comments are much better today. Now YouTube comments will no longer appear on Google+ and Google+ posts that share a YouTube video will no longer be added as YouTube comments. "In the coming weeks, YouTube will no longer require a Google+ profile when you want to upload, comment, or create a channel," mentions the YouTube Blog. Google reassures users that Google+ will continue to exist and will become "a place where people engage around their shared interests". It's a much smaller goal for a service that used to tie all the other Google services, add unified sharing and identity information. Google+ used to be more than a service, it was a layer that was supposed to make Google products work together. "Until now, every single Google property acted like a separate company. Due to the way we grew, through various acquisitions and the fierce independence of each division within Google, each product sort of veered off in its own direction. That was dizzying. But Google+ is Google itself. We're extending it across all that we do — search, ads, Chrome, Android, Maps, YouTube — so that each of those services contributes to our understanding of who you are." Bradley Horowitz is now the Google VP of Streams, Photos, and Sharing. That's "Streams, Photos, and Sharing" and not Google+. 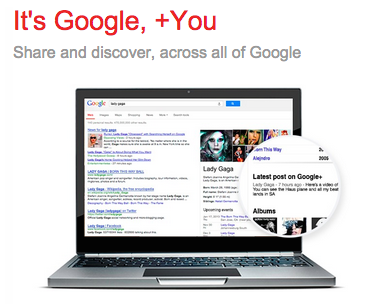 Ever since it was launched back in 2011, Google+ meant 2 things: the stream and the sharing platform. It looks like Google+ now focuses on the stream, which was less successful than the sharing platform. It's not clear how Google+ will continue to exist if Google removes important features like photo sharing and starts to remove the integration with YouTube and other Google services. It just makes it easier for Google to discontinue Google+, now that fewer people will use it. I'm not sure if this is new, but I've noticed that Google now promotes the Inbox app when opening Gmail in the mobile browser. "Get Inbox by Gmail, a new email app from the Gmail team," suggests the interstitial page, which still lets you "go to the mobile Gmail site". 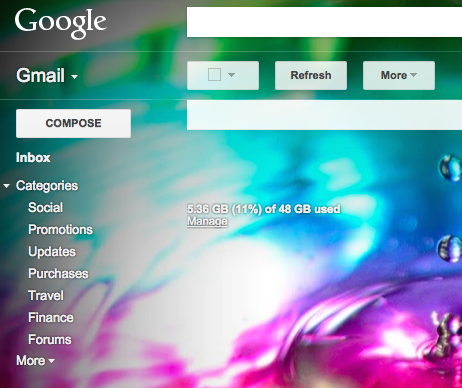 Google used to promote the Gmail app. YouTube has recently changed the settings for notifications. When you subscribe to a channel, there's a box that says "Send me all notifications for this channel". The settings page has a new label for the email digest checkbox: "Occasionally notify me of new videos and activity from my subscriptions" and you can choose if you want email notifications, mobile notifications or both email and mobile notifications. 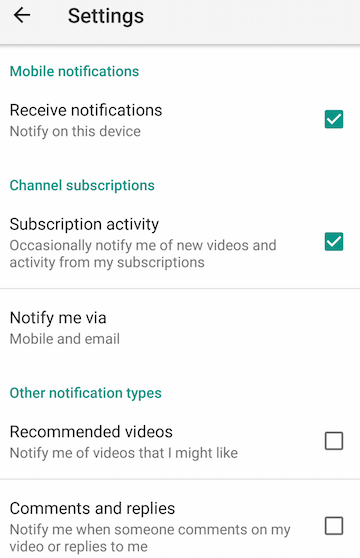 Mobile apps for Android and iOS have a notification section in the settings, which lets you disable or enable notifications, customize notification types (subscription activity, recommended videos, comments and replies) and also see all your notifications. 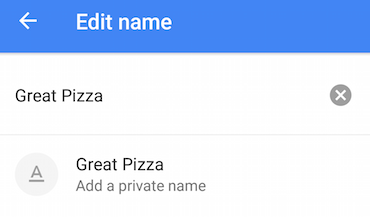 The latest version of the Google Maps app for Android lets you add private names for places. Search for an address or drop a pin on the map, tap the 3-dot menu icon and pick "Edit name". You can add a name that lets you quickly find the place on the map, just like you can find "home" or "work". The private name is saved to your Google account and you're the only one who can see it. 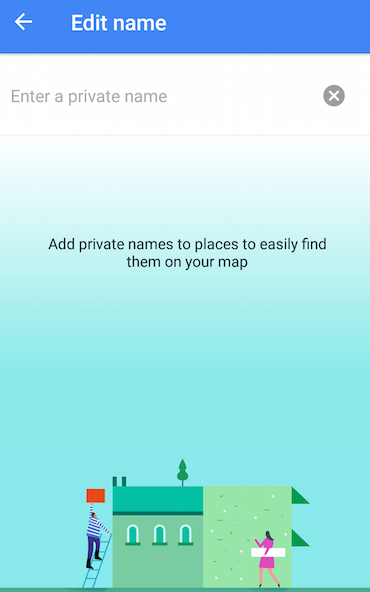 To edit a name or delete it, open the side menu and tap "Your places". At the top of the section, you can find the named places, including "home" and "work". Google Maps also has a new interface for location history: it's called "your timeline" and it's available on the web and in the Android app. "Your Timeline allows you to visualize your real-world routines, easily see the trips you've taken and get a glimpse of the places where you spend your time. And if you use Google Photos, we'll show the photos you took when viewing a specific day, to help resurface your memories," informs Google. You can customize the timeline by removing places or adding private names. This feature still requires Location History, which can be enabled or disabled from Google Maps, Google Settings or My Account. 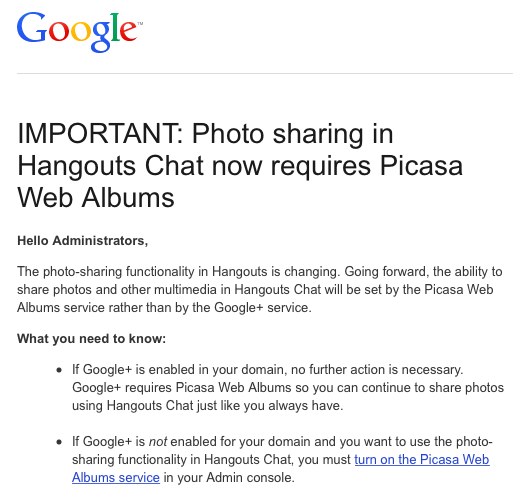 Now that Google+ Photos is discontinued, Google Apps admins received a message which informs them that Google Hangouts will only use Picasa Web Albums for photo sharing. "The photo-sharing functionality in Hangouts is changing. Going forward, the ability to share photos and other multimedia in Hangouts Chat will be set by the Picasa Web Albums service rather than by the Google+ service. If Google+ is enabled in your domain, no further action is necessary. Google+ requires Picasa Web Albums so you can continue to share photos using Hangouts Chat just like you always have. If Google+ is not enabled for your domain and you want to use the photo-sharing functionality in Hangouts Chat, you must turn on the Picasa Web Albums service in your Admin console." 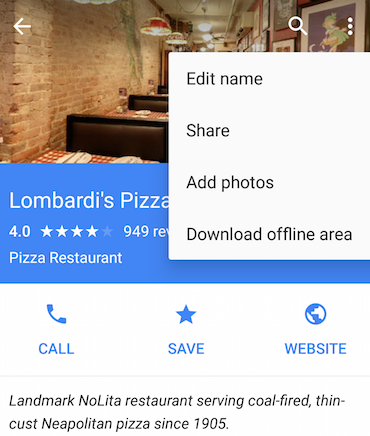 This change also affects regular Google users, since photos shared using Hangouts aren't added to Google Photos and you'll only find them in Picasa Web Albums when Google+ Photos will shut down. The same thing will happen with Blogger photos. Picasa Web Albums and Google+ Photos served as a central hub for almost all the photos uploaded using Google services. This was great, since you could find all your photos in one place, but it also cluttered Picasa Web and Google+ Photos with albums automatically generated by Blogger, Google Hangouts and other services. 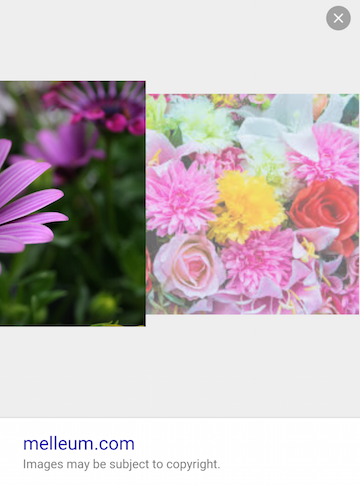 It looks like Picasa Web Albums is here to stay, at least for now. Google announced that Google+ Photos will no longer be available in a few weeks, so everyone will have to switch to Google Photos. "In an effort to ensure everyone has the best photos experience we can deliver, on August 1st we'll start to shut down Google+ Photos - initially on Android, and soon thereafter on the Web and iOS." Google has recently discontinued the Google+ Photos app for Chrome. 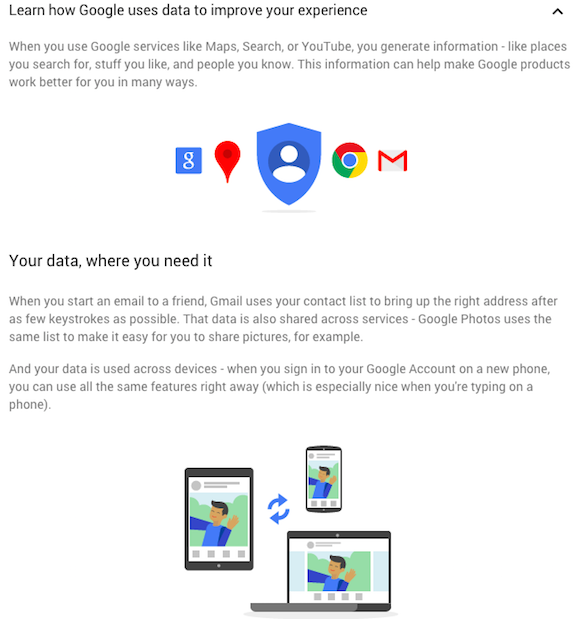 Google Photos was launched 2 months ago and there are many missing features. 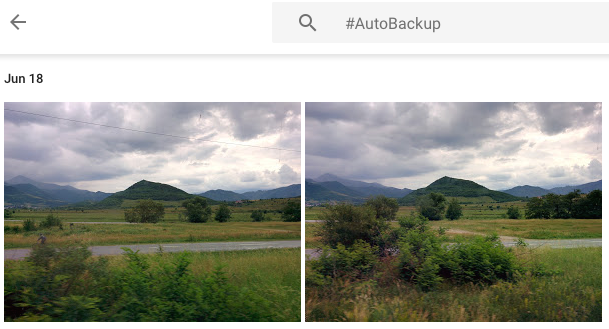 For examples, some powerful editing features from Google+ Photos for desktop are not yet available in Google Photos, global Auto Enhance is missing and you can't cast photos, organize albums, edit location and date taken or tag people in Google Photos. Since both services are 2 interfaces that show almost the same photos and videos, you can find most of your files in Google Photos. 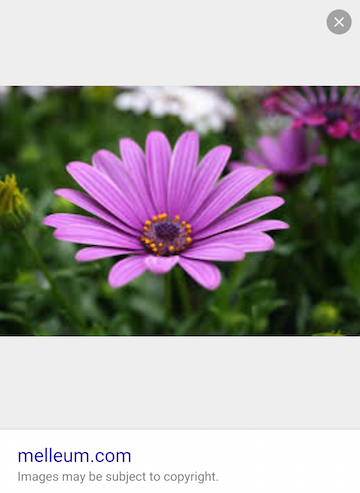 Apparently, photos shared in Blogger and Hangouts are only available in Picasa Web Albums, for now. If you don't like Google's new service, there's always Google Takeout, which lets you export all your photos and videos. 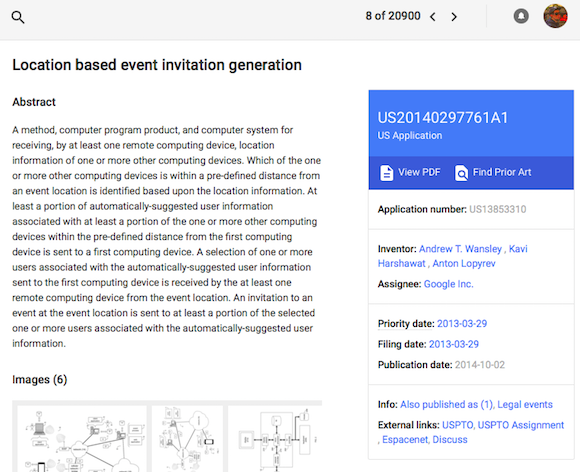 There's a new version of Google Patents that's available at patents.google.com. The interface now uses Material Design, there's a checkbox that lets you search Google Scholar, advanced search options are available in the sidebar and you can quickly navigate between search results, which are now grouped by category. The prior art finder is now properly integrated and no longer uses a different interface. You can now click the navigation icons at the top of the page to go to the previous or the next search result. Keyboard shortcuts also work: use the left/right arrow keys. "The new Google Patents helps users find non-patent prior art by cataloguing it, using the same scheme that applies to patents. We've trained a machine classification model to classify everything found in Google Scholar using Cooperative Patent Classification codes. 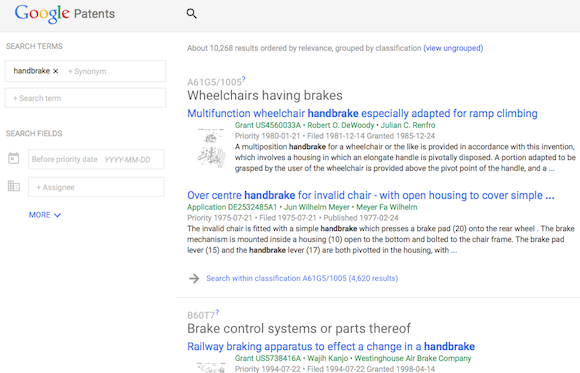 Now users can search for [autonomous vehicles] or [email encryption] and find prior art across patents, technical journals, scientific books, and more," informs Google. Another change is that you can search for foreign patent documents using English keywords. Patents without English full text are translated using Google Translate, so it's easier to find them. It's interesting to notice that the old Google Patents is still available if you use this URL: https://www.google.com/?tbm=pts. If you like Google Inbox and you're wondering why it doesn't replace Gmail, there's a setting that redirects Gmail to Inbox. Just go to Inbox, open the settings box, switch to the "Other" tab, enable "Redirect Gmail to inbox.google.com" and click "Done". The next time you type mail.google.com, gmail.com or click on a Gmail shortcut or bookmark, you'll be sent to inbox.google.com. You can still open Gmail: just click the new "Gmail" menu item, which is placed below "Contacts" in Inbox's sidebar. The URL that temporarily disables redirects is https://mail.google.com/mail/?ibxr=0. 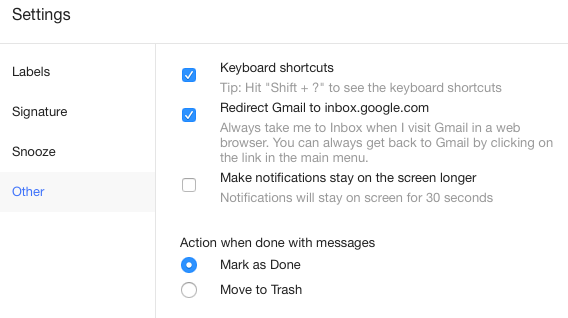 "If you often go to Gmail in your web browser when you really mean to go to Inbox, you can turn on a setting so that you'll automatically be taken to Inbox when you visit gmail.com or mail.google.com on a computer. You can always get back to Gmail using a simple link in Inbox," informs Google. The setting was added a few weeks ago. The page shows a list of information processed when you use Google and a list of reasons why it's processed. 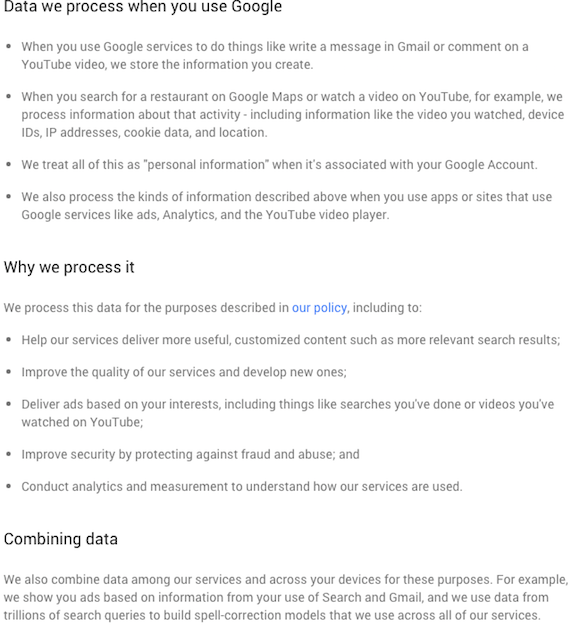 Google also explains how it uses data to improve user experience and lets you adjust some privacy controls (account history, ads settings, opt out of Google Analytics data collection). 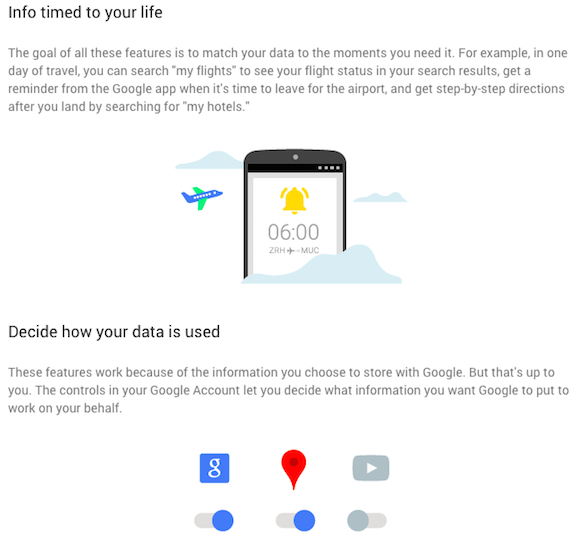 "These features work because of the information you choose to store with Google. But that's up to you. The controls in your Google Account let you decide what information you want Google to put to work on your behalf," informs Google. The "other options" link at the bottom of the page shows some advanced features. "You're in control of the information in your Google Account. You can edit or delete some or all of it. In other words, you can shape your experience how you like." 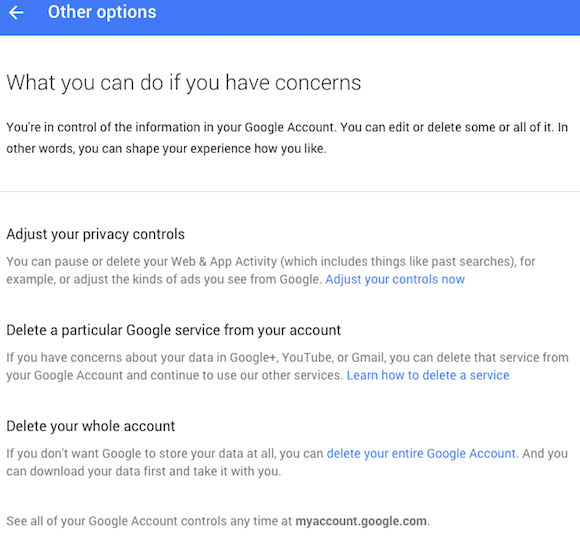 Google lets you pause or delete your Web & App Activity, delete a Google service like Google+, YouTube or Gmail and even delete your whole Google account. 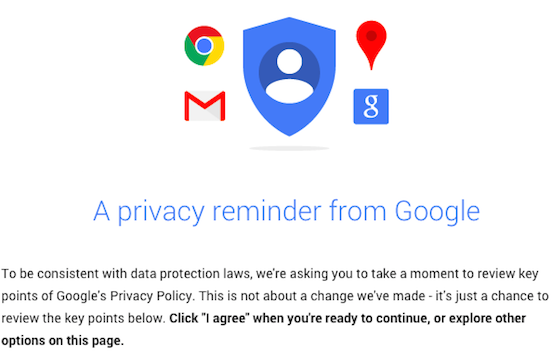 "If you don't want Google to store your data at all, you can delete your entire Google Account. And you can download your data first and take it with you." 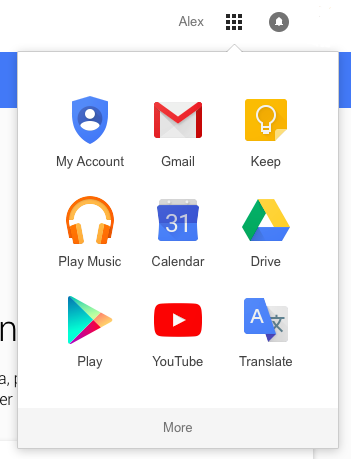 When Google launched My Account, a new interface for Google Account Settings, it added a shortcut to the app launcher, but only users who weren't logged in and for those who haven't customized the app launcher. Unfortunately, Google didn't provide a way to add the shortcut for all the other users. Now the "My Account" shortcut has been automatically added to the app launcher at the bottom of the "More" section, so you need to click "More" to see it. You can always customize Google's navigation menu using drag and drop. Gmail changed the text that's displayed when you don't have any message in your inbox. 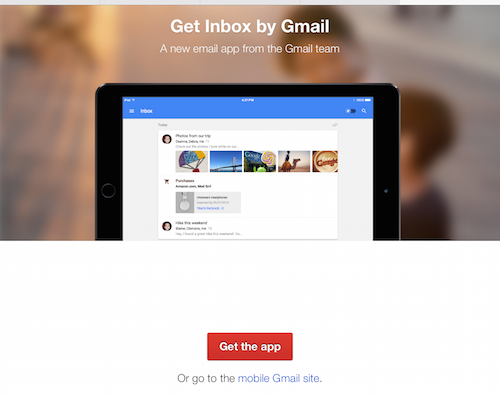 Now Gmail promotes Google Inbox: "No new mail! Want to hit inbox zero more often? 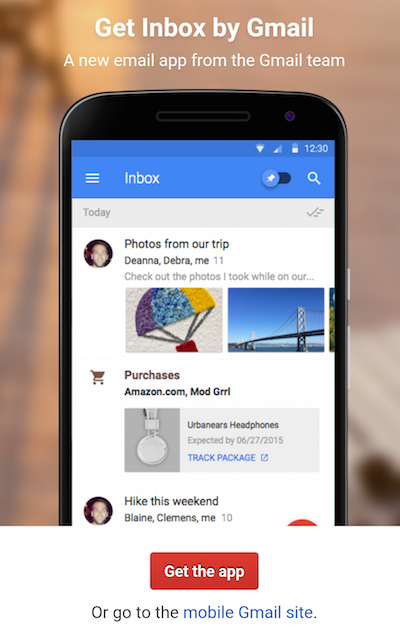 Try our new app, Inbox by Gmail." So why can you hit inbox zero more often if you use Google Inbox? You can snooze emails until you're ready to deal with them, you can open attachments, watch videos, open news articles and read important information extracted from a message without having to open it. For example, Google Inbox shows flight status next to flight reservation emails and package tracking links next to order updates from Amazon or other shopping sites. 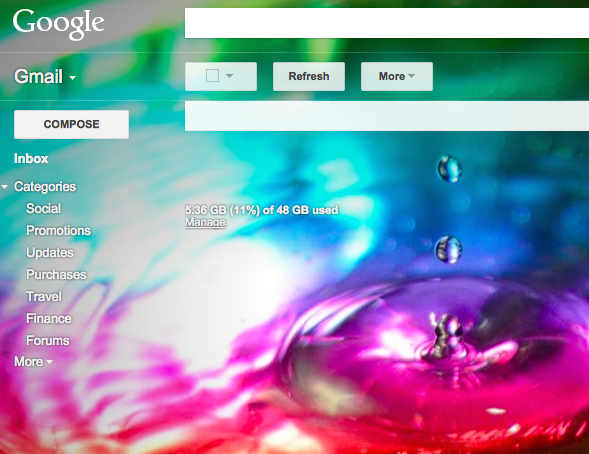 Last year, Google launched a new desktop interface for Google Drive. If you missed the old interface, the "settings" menu allowed you switch to the old interface by clicking "Leave the new Drive". The classic Google Drive also added a link to the new interface, so you could click "Experience the new Drive" and switch back to the new UI. 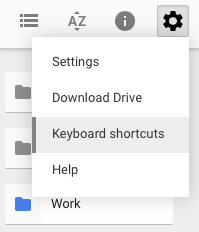 Now the "Leave the new Drive" option is missing and you can no longer switch to the old Google Drive. Even the URL for the old Google Drive doesn't work: https://drive.google.com/?srtp=0&authuser=0. Google still has a help center article about "switching between versions of Google Drive", which is now outdated. "Have you noticed that your Google Drive looks different? Or are you trying to do something in Drive and the instructions don't work? This may be because there are now two versions of Google Drive on the web – a new version and a classic version. The new Google Drive is gradually rolling out to all users, but you can switch to the new version, or back to the classic version, at any time," mentions the article. Gmail's theme gallery added hundreds of new high-resolution photos and many of them were taken by Google employees like Romain Guy and Greg Bullock. 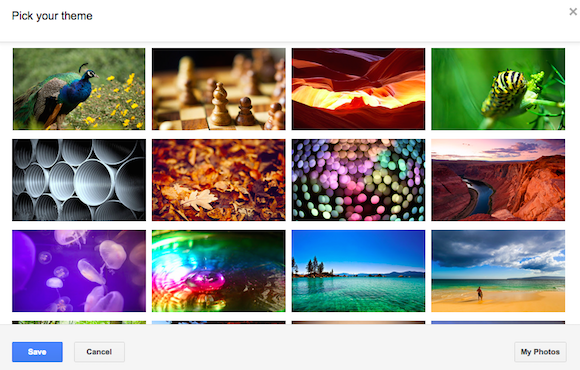 Click "more photos" in the "pick your theme" dialog to find all the new photos. You can still use your own photos, upload photos or paste a URL. 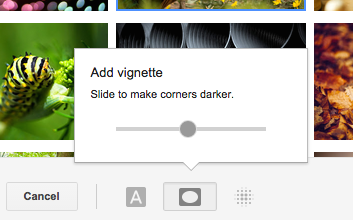 After you select a background image, Gmail lets you customize it using 3 features: select light or dark text background, add vignette to make borders darker or you can blur the background image. The nice thing is that Gmail remembers your settings for each theme, so you don't have to adjust them every time you select a new theme. The "theme" tab from Gmail's settings page is no longer useful, now that there's a separate theme picker. All the themes used to be displayed there, but now the tab only includes a link to "set theme". "Your inbox is home to some of your most meaningful and entertaining messages — from that acceptance letter, to those throwback photos — so we think it's important for Gmail to feel just as personal (and fun! )," says Google. 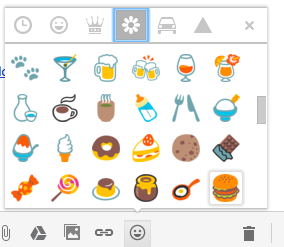 To make Gmail more fun, Google also added emojis for almost every occasion.